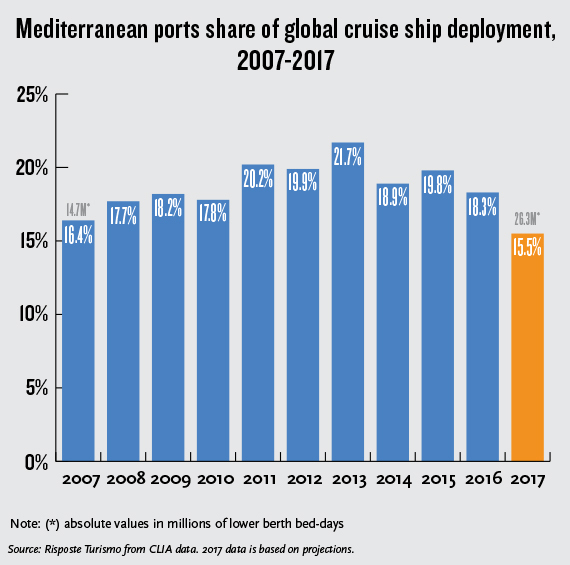 Fewer and smaller cruise ships being deployed in the Mediterranean this year by major cruise lines will hurt ports throughout the region, according to a recent projection of 2017 cruise passenger totals. Fears of terrorism in parts of the Mediterranean basin have sent the region’s share of global capacity to a 10-year low, according to the report by Risposte Turismo, a cruise research firm based in Venice. Only 15.5% of cruise ship capacity will sail in the Med this year, down from 18.3% last year and 16.4% in 2007. Francesco di Cesare, president of Risposte Turismo, said the decline is the result of a mix of factors, among them the “no-go zones for cruise ships,” which currently include destinations such as Turkey, Tunisia and Egypt. A spokeswoman for the Port of Barcelona confirmed that it is expecting more than 800 cruise ship calls this year, up from 758 in 2016, which can be attributed in part to Barcelona’s strength as a turnaround port. About 58% of the 2.6 million visitors to Barcelona last year were boarding or disembarking a cruise, said the spokeswoman, who asked not to be quoted by name. By contrast, the major ports in Italy are expecting declines. According to Risposte Turismo, the number of passengers handled by Italian ports will drop 7.1% this year, to 10.3 million, while the number of ship calls will be down 9.6%, to about 4,500. Risposte Turismo expects Civitavecchia, the port for Rome and the second-largest cruise port in the Med after Barcelona, to see 5.9% fewer passengers this year, and Venice, the fourth-largest Med port, to see an 11.4% drop. Naples, the sixth-largest port, is expected to see a 23.4% drop in passenger numbers, while among the top Italian ports only La Spezia, the gateway to the Cinque Terre region, will eke out a 0.2% increase, the study found. Di Cesare expects Marseille, France, the fifth-largest Med port, to experience a 6% drop in passengers this year. Venice is a major turnaround port for cruise ships on eastern Mediterranean itineraries, which have been affected by cruise lines dropping Turkish ports due to an ongoing threat of terrorism. Venice is also impacted by limits on the size of cruise ships that can reach the city through the Giudecca Canal. 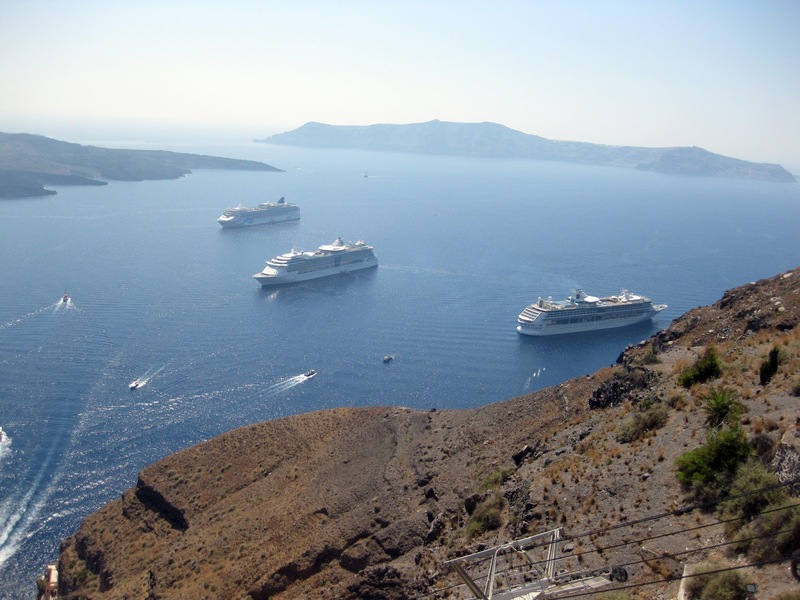 Greek tourism minister Elena Kountoura said the number of cruise calls to Greek ports is expected to be down this year, but the number of passengers is expected to rise because of larger ships being deployed. Often, lines that have canceled calls to Turkey have substituted stops at Greek ports. Di Cesare said Tunisian ports were dropped after two 2015 terror attacks and although the ports began getting calls again in late 2016, lingering uneasiness continues to affect itinerary planning. Weak results in the Med influenced Celebrity Cruises to bringthe Celebrity Equinox back to the Caribbean this summer, while Norwegian Cruise Line, diversifying its capacity out of the Caribbean, moved the Norwegian Getaway this summer to Baltic itineraries rather than Mediterranean ones. 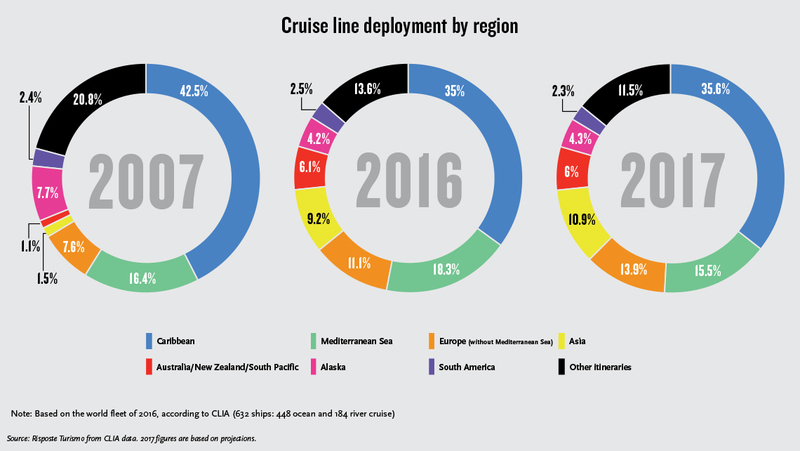 Di Cesare said that regions other than the Med are perceived by cruise lines this year to have a higher return on investment and more demand from passengers. That said, the Med will continue to be the world’s second most popular cruising region, behind the 35.6% of capacity devoted to the Caribbean but ahead of the 11.5% of ships doing itineraries in Europe outside the Med. The drop in Med traffic comes after several strong years. Italian ports had 11.1 million passenger movements in both 2015 and 2016, close to the record of 11.5 million set in 2011, Risposte Turismo figures showed. The spokeswoman from the Port of Barcelona said growth there had been “spectacular” for about a decade but has leveled off in the past few years to a more sustainable percentage, though it is still an increase. Next year, the Med’s share of passengers stands to increase if there are no more terrorism incidents to reduce demand. For example, Royal Caribbean International said it will have eight ships in Europe for 2018, up from seven this year, including its 5,400-passenger Symphony of the Seas, which will do seven-day trips from Barcelona that include stops in Palma de Mallorca, Marseilles, La Spezia (Florence/Pisa), Civitavecchia and Naples. 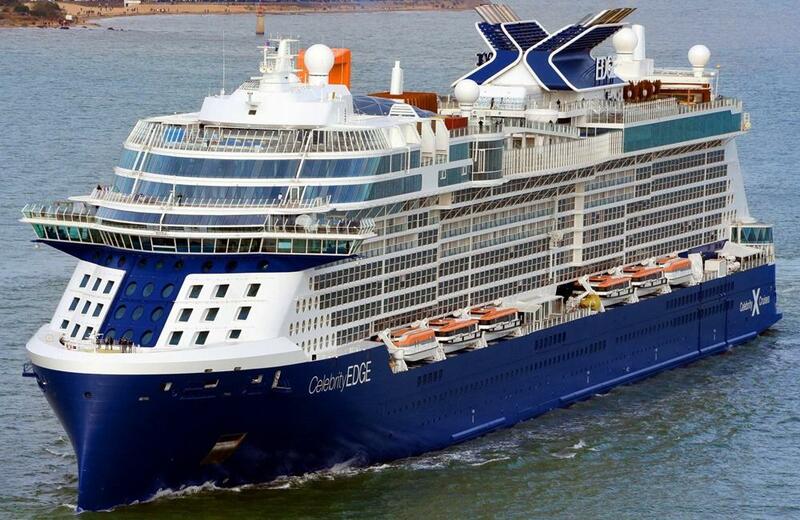 Nobel Laureate and UN Messenger of Peace, Malala Yousafzai, has been named as the godmother of Celebrity Cruises new ship Celebrity Edge as part of a two-year partnership between the line and the Malala Fund. The 19-year-old, whose mission is to secure 12 years of safe, free, quality education for every girl, will christen the ship in Fort Lauderdale on December 18. Celebrity president and chief executive Lisa Lutoff-Perlo said the association with Malala Fund and choice of Malala as godmother for Edge “felt so right” for the brand, which shares a commitment to diversity, inclusion, gender equality and education. Speaking exclusively to Travel Weekly, Lutoff-Perlo said: “The tradition of Godmother is one of the purest in a commercial world. Malala began her life as an activist at 11 years old, writing a secret blog about life under the Taliban, who would not permit girls to go to school. She was targeted for her advocacy and, at 15, was shot on her school bus. 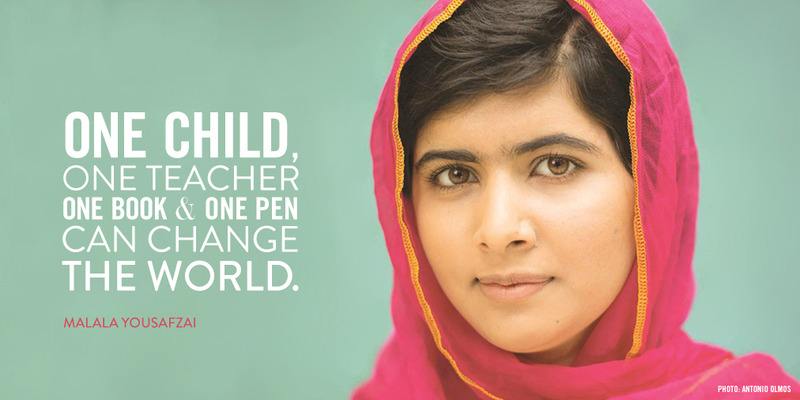 Malala survived the attack and continued her campaign for girls’ education around the world. Lutoff-Perlo said that Malala’s dedication to girls’ education sets an example worth following. Lutoff-Perlo said Celebrity had been working on the partnership, which sees the line commit an undisclosed amount of money to the Malala Fund for two years, for some time. Lutoff-Perlo explained there would be many ways for crew and guests to get more involved in the partnership. “There will be specially-commissioned Malala Fund/Celebrity merchandise which guests and crew will be able to buy on board, with all proceeds going to the fund. A documentary about Malala will be played on the in-cabin TV channels, and Malala’s book ‘I am Malala’ will also be on sale,” said Lutoff-Perlo. And she confirmed that UK agents would also play a part. “They will absolutely be invited to Florida next December to witness Malala naming Celebrity Edge,” he said. Celebrity previously partnered with breast cancer charities for its Solstice Class ships, inviting breast cancer survivors, who had done extraordinary things, to be the Godmothers. Whilst there’s plenty to love on a Norwegian Cruise Line cruise, there’s one place on board that will turn your holiday from great to perfection. Tucked away at the tops of Epic, Breakaway, and Breakaway Plus class ships lay a little slice of paradise known as The Haven. Where glorious rooms meet unmatched pampering, a cruise in The Haven is like cruising in first-class. If you can swing it, here’s why spending a little more for this exclusive enclave may be worth your whilst. If you have to pick The Haven for one reason and one reason alone, let it be for their accommodations. Not only are these rooms beautifully decorated, they are the most spacious. If you are travelling in a big group there’s nothing better than the 3-Bedroom Garden Villa, one of the grandest rooms Norwegian has to offer. Start off your holiday with a complimentary limousine, ready to whisk you to your awaiting 4800+ square feet suite. Complete with a courtyard, hot tub and a sprawling living room with a baby grand piano, the 3-Bedroom Garden Villa is the ultimate way to cruise. If you are travelling in a smaller group, stay in the Deluxe Owner’s Suite with Large Balcony or Owner’s Suite with Large Balcony. These rooms, though smaller than the 3-Bedroom Garden Villa, do not skimp on luxury. Sweeping floor to ceiling views and private balcony makes these rooms worth the price tag. For those who are looking for something more intimate I suggest unwinding in The Haven Spa Suite with Balcony. Offering an oversized waterfall shower with body jets, in-room Jacuzzi, and free access to the Thermal Spa Suite, this room is the ultimate way to relax and rejuvenate. Gone are the days of elbowing through buffet crowds or fighting for the last deck chair because The Haven offers exclusive venues only accessible by Haven members. In The Haven Lounge you’ll find a comfortable seating area perfect for meeting other Haven guests and a private bar ready to concoct your favourite drinks. 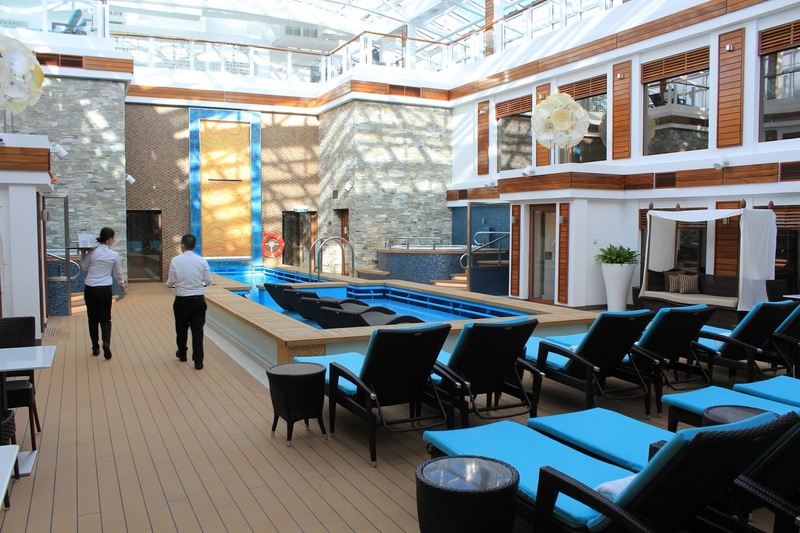 The Haven Lounge opens up to The Haven Courtyard where you will find a pool, multiple hot tubs and a private sun deck with plenty of loungers for you to enjoy. Keep an eye out for the deck valets who come around with complimentary wet towels and cold fruit skewers! If you have a hankering for something more, make your way to The Haven Restaurant where you can order items such as Foie Gras, Grilled Atlantic Cod, and Whole Roasted Prime Rib. If you like to be pampered you’re in the right place. Haven guests are the only people on board that will have access to a 24-hour trained and certified butler. Waiting on your beck and call, your butler can assist with tasks ranging from pouring your champagne, setting up in suite dining, and even unpacking and packing your suitcase. In addition to that you have access to a private concierge, perfect for a stress free holiday. Whether you want to make a last minute reservation in a Speciality Restaurant, attend a Broadway show or register for a Shore Excursion, your private concierge can pull together your plans in a drop of a hat. As if all of this wasn’t enough, as a Haven guest you will receive exclusive extras. Personal favourites include a complimentary bottle of French Champagne or Sparkling Wine, a bottomless fruit basket, savory or sweet gourmet treats delivered to your room each evening, and a special cocktail party with the ship’s officers! A cruise on Norwegian Cruise Line will bring you to beautiful destinations on a ship with more options than you’ll know what to do with. If you want a holiday experience like no other, cruise in The Haven, where luxurious accommodations, unparalleled service, and indulgent amenities are the standard. Once you have the best of the best in The Haven, you’ll never want to cruise any other way.